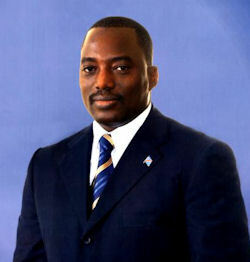 Joseph Kabila Kabange has been President of the Democratic Republic of the Congo since January 2001. Congolese President Joseph Kabila originally rose to power a decade ago, at the age of 29, after the assassination of his father, Laurent. Laurent Kabila had become president after helping to oust dictator Mobutu Sese Seko. He appointed Joseph, the eldest of his 10 children, as chief of the country’s armed forces. Son of Laurent Désiré Kabila, former President of the Democratic Republic of Congo and Mama Sifa Mahanya, Joseph Kabila Kabange (known commonly as Joseph Kabila) was born June 4, 1971 in Hewa Bora II, community of Lulenge, territory of Fizi, Province of South Kivu in Democratic Republic of Congo. He hails from the town of Ankoro, capital of community - sector Kamalondo, territory of Manono, District of Tanganyika. The young Joseph Kabila began his primary studies at Fizi in the undergrowth of Sud-Kivu, Democratic Republic of Congo, studies which he finished at the École française de Dar-es - Salaam in Tanzania. He then continued and finished his secondary education in Tanzania. The need to continue the revolution forced him to undertake military training in Tanzania so that he could pursue a classical education as happens often. In 1996, Joseph Kabila was appointed commander of the operations on the then Lubumbashi and Kinshasa Kisangani axis during the advance of the troops of liberation towards Kinshasa. In 1997, he went to China to complete his military studies at the University of the National Defense in Beijing. In 1998, he was appointed Chief of staff - Deputy General of the FAC (Congolese Armed Forces) and became Chief of staff of the land forces in 2000. January 26, 2001, he was sworn in as President of the Democratic Republic of Congo, succeeding his father the President Laurent Désiré Kabila died following the assassination of January 16, 2001. When it became clear that Laurent Kabila's gunshot wounds were fatal, Chief of Staff Georges Buse and Deputy Chief of Staff Jean Mbuyu, in consultation with several other members of the presidential cabinet, met to decide on a successor. They settled on his son Joseph as the only person who could hold together various government and military factions. The task of selling their choice to other power brokers was not easy. Old guard hard-liners Kakudji, Mwenze, and Yerodia resisted. Kakudji reportedly wanted to be president himself. Military commanders also had to be convinced, but this wasn't as difficult since Joseph was well known and generally respected within the military. An unexpected obstacle was Joseph's initial reluctance to accept the offer. Once this was overcome, Buse and Mbuyu presented Joseph Kabila to the rest of the government as the new president. Electoral officials in the Democratic Republic of Congo said December 08, 2011 President Joseph Kabila won re-election in a vote marred by violence and delays. Congo's Electoral Commission president Daniel Ngoy-Mulunda said President Kabila won re-election with 48.9 percent of ballots. His closest challenger, the long-time opposition leader Etienne Tshisekedi, finished with 32 percent of the vote. Turnout for last month's presidential and legislative polling was about 58 percent. On February 23, 2015 two opposition officials of the Democratic Republic of Congo are calling on President Joseph Kabila to step down at the end of his term next year, saying the constitution barred him from seeking a third term. This came after the Independent National Electoral Commission has set presidential and parliamentary elections for November 27, 2016 if certain conditions are met, including the availability of funds to organize the vote.